A step-by-step full photo tutorial of how to work the crochet crocodile stitch. This is a complicated stitch, but makes a beautiful pattern. It adds a third dimension to your crochet projects! I used this stitch to create an adorable clutch! This stitch was quite tricky for me at first, and I had to really study several YouTube videos to figure it out. I really wanted a nice photo tutorial because videos drive me crazy – it’s so hard to rewind and impossible to watch in slow motion. So, if you also prefer photo tutorials, then you are in luck! This is quite a tricky stitch, so I’ve broken it down in two parts. When you’re done with this one, go to part 2! Make a chain however long you want, as long as it’s multiples of 6. For a clutch, I made a 36 chains. In the third chain from the hook, work 2 half double crochets (in the same chain). Chain 1, skip 2 chains and work 1 half double crochet. *Chain 1, skip 2 chains and work 2 half double crochets in the same chain. Repeat the length of your chain, ending with 1 half double crochet in the last chain. Here’s how the first 2 half double crochet will look, with the last 3 chains. On the first of the two half double crochets, work 4 half double crochets from top to bottom. Turn your work upside down and work 4 more half double crochets on the last of the set of 2 half double crochets from bottom (of the work) to the top. Here’s how step #3 will look after you’ve worked 2 of the half double crochets. Once you finish step #3 and turn your work right side up, the first completed crocodile stitch will look like this! Work a slip stitch on the next single half double crochet. Start the next crocodile stitch on the next pair of half double crochets by crocheting 4 half double crochets on the first post closest to your right hand and from top to bottom. Then, just like in step #3, turn your work upside down and work 4 more half double crochets on the second post. 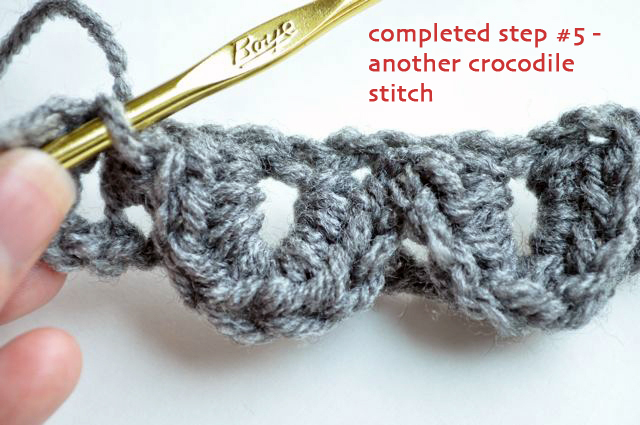 Completed step #5 – now you’ve finished two crocodile stitches! Continue working steps #2 to #4 for the length of your work, working a crocodile stitch on each pair of half double crochets and a slip stitch on each single half double crochet. You will end with a crocodile stitch and it should look like this! Now, head on over to part two to finish the project!